I share with you the last edition (Volume 29 (2010) No. 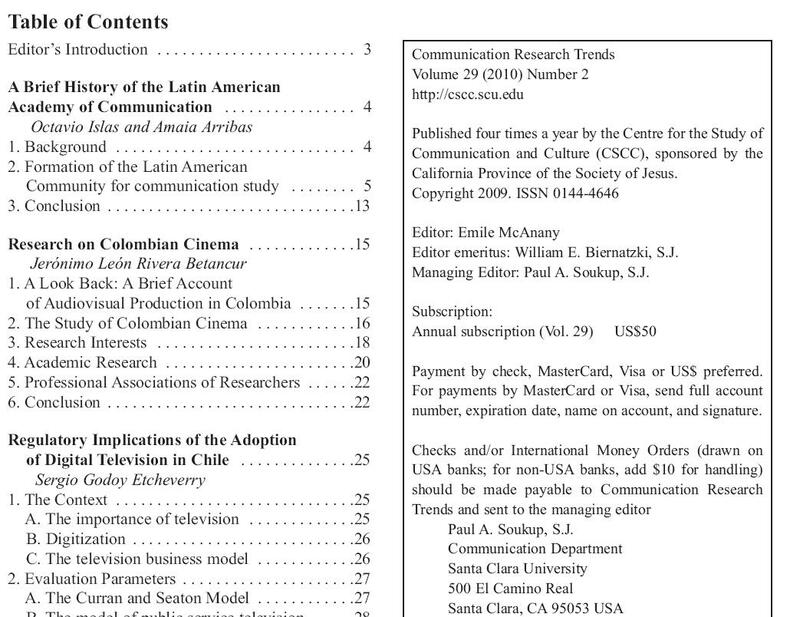 2) of the journal “Communication Research Trends from Centre for the Study of Communication and Culture of Sta. Clara University, whose central topic was the Communication in Latin American Contexts. I am proud, because I published an article about cinema in my country (Colombia) and this one is my first article in english. This is a paragraph of the editorial: Jerónimo León Rivera Betancur from Colombia and Sergio Godoy from Chile illustrate both nacional and common concerns for their colleagues in other countries. Rivera has provided one of the first serious efforts to draw together the history of film in his country, arguing that this effort is important in any country wishing to understand the place of this medium in telling the story of its society. His efforts are a beginning, and a useful beginning, of what should grow into deeper study. It is also a study that can be shared across borders.